What can be the best gift a grandfather could give to his grand children? The material possessions, the assets, band balances etc. are all perishable, they won’t last long. 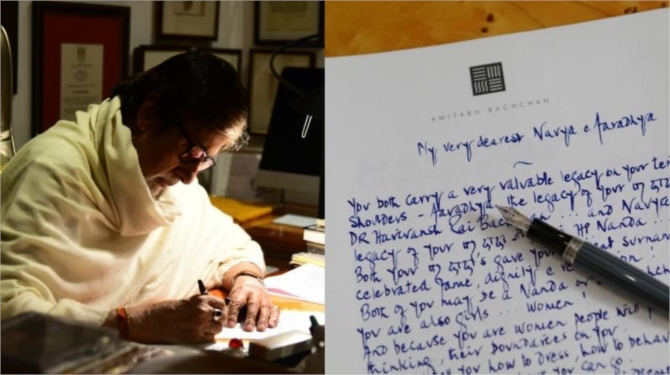 So, Mr. Amitabh Bachhan in his own charismatic style decided to pass on the most precious thing he ever had, which is his age old experiences of the life in the form of a letter. Mr. Bachhan has penned down a letter addressing to his two precious granddaughters- Navya Naveli and Aradhya Bachhan. The letter notes down the importance of the legacies which both the girls are carrying, but then he suggests not to get carried away with the world’s opinion. He encourages them to always listen and follow their heart and never let anyone dictate their decisions. He suggests, that things might get difficult as the society does not accept the various faces of a woman, but, he says that it is s the women like his grand daughters, who shall stand to make it change. Furnishing it with the most valuable advice, he notes, never to care about “log kya kahenge!” and do what you feel right with all your heart. This is one such gift which will stay with them and they can cherish it, and live it in the coming times. Both your pardadajis gave your present surnames celebrated fame, dignity and recognition. Both of you may be a Nanda or a Bachchan, but you are also girls… women. And because you are women people, will force their thinking, their boundaries on you. They will tell you how to dress, how to behave, who you can meet and where you can go. Don’t live in the shadows of people’s judgement. Make your own choices in the light of your own wisdom. Don’t let anyone make you believe that the length of your skirt is a measure of your character. Don’t let anyone’s opinion of who you should be friends with, dictate who you will be friends with. Don’t get married for any other reason other than you want to get married. This may be a difficult, difficult world to be a woman. But I believe that it is women like you that will change that. It may not be easy, setting your own boundaries, making your own choices, rising above people‘s judgement. But you, you can set an example for women everywhere. Such is the greatness of our living legend Mr. Bachhan. The world would become a better place to live in, if every girl gets the privilege of having such grandfather!